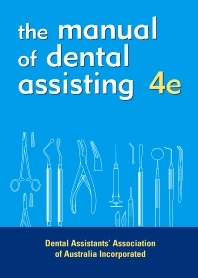 The Dental Assistants Manual, 4th edition is a reference manual catering for all aspects of dental assisting. It supports and is aligned to important Australian government standards including, the National Competency Standards part of the recently endorsed Health Training Package; NHMRC Guidelines for Infection Control; Occupational Health & Safety Standards put down by Worksafe Australia and Australian/New Zealand Standards 4815 ‘Office base health care facilities not involved in Complex Patient Procedures & Processes'. Adherence to these standards ensures that the Dental Assistants Manual is not only a valuable reference for students, it can be also be used right across Australia and New Zealand as a reference tool in any dental surgeries, clinics or laboratories. The Dental Assistants Manual is intended to provide the required knowledge for achieving the newly endorsed National Competency Standards for the Certificate III in Dental Assisting endorsed by ANTA (Australian National Training Authority) in January 2002 which forms the basis for further study in Certificate IV courses in areas such as Dental Technology, Dental Health Education, Dental Assisting - Radiology and Dental Technician. It provides step-by-step instructions on how to carry out certain practical components and requirements of the competencies. No other reference tool in Australia or New Zealand addresses any of the implications of these standards for dental assistants in the workplace. · Addresses the National Competency Standards in the recently endorsed National Training Package. · Contains most recent NHMRC guidelines for Infection Control. · Includes latest Occupational Health &Safety Standards put down by Worksafe Australia. · Covers ANZ standards 4815 "Office based health care facilities not involved in Complex Patient Procedures & Process - Cleaning, Disinfection & Sterilising Reusable Medical & Surgical Instruments, Equipment and Maintenance of the Associated Environment"